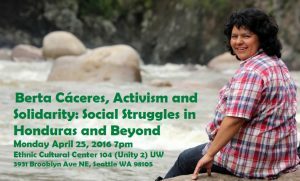 On Monday April 25, 2016 at 7pm, the Channel Foundation co-hosted a memorial panel discussion for Berta Isabel Cáceres Flores, an Indigenous (Lenca) Honduran environmental activist who was assassinated on March 3, 2016. Channel had just hosted her for a series of events in Seattle five months previously and wanted to honor her incredible work while coming together with others to mourn her loss. Berta’s assassination made the human rights defenders work Channel funds personal and all the more vivid. She was co-founder and coordinator of the Council of Popular and Indigenous Organizations of Honduras and won the Goldman Environmental Prize in 2015 for “a grassroots campaign that successfully pressured the world’s largest dam builder to pull out of the Agua Zarca Dam” at the Río Gualcarque. Her death sparked expressions of solidarity, outrage, and organizing around the world. This panel discussion examined what Berta’s life and death can teach us about solidarity and struggle in Central America and beyond. The event wa s co-hosted by the Latin American and Caribbean Studies, Center for Human Rights, Channel Foundation, Garinagu Houngua, Community Alliance for Global Justice.